The Cazenovia Fund consists of unrestricted annual gifts – these gifts are the College’s top priority. Why Support the Cazenovia Fund? Every gift matters. 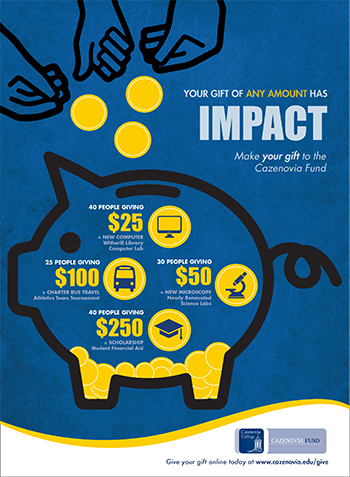 A majority of the gifts that Cazenovia receives are in amounts less than $500. By giving to the Cazenovia Fund these gifts accumulate for a common purpose and allow each gift to have the greatest impact. Every area is strengthened. The Cazenovia Fund covers all parts of the College – including scholarships, academics, the arts, athletics and more. Every Cazenovian benefits. Gifts to the Cazenovia Fund benefit every student, every day, and help ensure the continuing value of a Cazenovia degree for all alumni.